Canadians are cutting back on their international travel, but why? Demand for international travel says a lot about the state of the world. It soars when people are feeling good about their finances and when the world is relatively peaceful; and it suffers when the economy goes pear-shaped and when war and terrorism are top concerns. For years in Canada, the boom in international travel to countries other than the United States was a good news story. In October, Statistics Canada released its latest international travel numbers showing that 992,872 Canadians had returned from a foreign country other than the United States in August 2018, some 46 percent higher than the 679,234 Canadians who did so 10 years earlier in August 2008. A closer look at the numbers, however, revealed more disturbing news: Canadians have been cutting back on their travel in 2018. The 992,872 who came home from abroad in August was down eight percent from the 1,074,086 who did so in August 2017. Statistics Canada’s collection of data on Canadians’ international travels goes back to January 1972, which makes it possible to track year-over-year changes going back to January 1973. Of the worst 10 percent of the 548 months for which year-over-year data is available, five of those months occurred during 2018 — January, and May through August. Why is this slump happening, in a year when airlines have been adding new capacity to foreign destinations and prices have remained about the same? Is it a response to an increasingly uncertain foreign world, or a sign that Canadians are feeling apprehensive about their financial circumstances? Let’s look back at similar slumps. One such rough patch happened from Sept. 1979 through Aug. 1981, which featured 24 consecutive months of year-over-year shrinkage amid high inflation and an economic recession, with the worst months being between Mar. 1980 and Mar. 1981. The summer of 1986 was also particularly bad, with results for each month from May through September being five to 10 percent worse than the same months in 1985. This slump cannot be blamed on the economy, which was going through a relatively good stretch in 1986. The previous year, however, had featured several terrorist incidents — including the Air India bombing and the coordinated assault rifle and grenade attacks on the check-in areas at the Rome and Vienna airports — and high-fatality airliner crashes at Dallas/Fort Worth Airport and in Japan. The economy pummelled traveler numbers again in the early Nineties, with some months during 1991 being more than 10 percent off the same month in 1990 as Canada went through its second severe recession in a decade, with unemployment rates hitting 10 percent. Apart from some weakness in 1999-2000, the next serious drop in traveler numbers took place from Oct. 2001 through Aug. 2002, undoubtedly on account of the 9/11 terrorist attacks. What is behind the travel slump of 2018 is not yet clear, but one can hope that it’s simply a sense of unease about the state of the world, and not the chill of an oncoming recession. When Donald Trump was sworn in as U.S. president in January, promising tourism-unfriendly ideas such as more aggressive border screening and a “Muslim ban”, this led to questions about whether or not the U.S. tourism industry would experience a “Trump Slump” as international tourists chose to holiday elsewhere. So far, results have been mixed. “It’s official: Trump slump slows summer travel to the U.S.”, the MarketWatch business news site proclaimed in late April, noting that “online searches by prospective travelers to the U.S. have fallen by 6% year-over-year in the first quarter of 2017, according to a study from software company Adobe”. Yet in July, The Economist – no friend of the president – noted that “Donald Trump’s effect on tourism has not been as bad as feared”. The same words might apply to Canadians’ travel tendencies. Statistics Canada released its July 2017 international travel numbers this morning – the first month of the peak holiday season – and the findings show that the number of Canadians returning home from the U.S. was slightly higher in July 2017 than in the same month in 2016. Returns home by Canadians visiting the U.S. were up three-tenths of a percentage point in July, compared to the same month in 2016, on a seasonally adjusted basis, which smooths out seasonal variations. On an unadjusted basis, which I’ll use below, the July 2017 numbers were up seven-tenths of a percentage point over July 2016. This suggests that if there is a “Trump Slump” in Canada, it’s a mild one. Although one could argue that the small rise in cross-border traffic failed to keep up with population growth – Canada’s population grew 1.2 percent between July 2016 and July 2017 — and that per capita visits to the U.S. were actually down a bit, Trump’s election and inauguration doesn’t seem to have had a drastic effect on Canadians’ travel habits. More noteworthy is an ongoing change in how Canadians visit the U.S., and the growing international competition for the Canadian tourism dollar. The number of Canadians returning home from the U.S. by automobile has been lower each July compared to the same time the previous year in each of the past five years. The effect was particularly noticeable in Manitoba, where the number of Canadians re-entering the country via one of our highway entry points along the Minnesota and North Dakota borders had declined for several consecutive years now, from 182,938 in July 2012 to 116,668 in July 2017. Canadian cross-border travel has been shifting in recent years from road trips to air trips – up a whopping 15 percent year-over-year in July — which could suggest we’re less keen to visit nearby border states but still willing to visit more distant places like California and Florida; or perhaps New York City, a destination less suitable for motor trips. The U.S. tourism industry also continues to feel the effect of increased competition from other countries. From 1972, the first year in which Statistics Canada started tracking these numbers, to 1997, 95 percent or more of Canadians returning from abroad each July were returning from the U.S. This enormous market share remained at 90 percent or better into the mid-2000s. During the past four years, however, other destinations have been making quick inroads into the Canadian market. Whereas only two percent of Canadians returning from abroad in July 1972 were returning from countries other than the U.S., their collective share of the market ballooned from 11 percent in July 2013 to 19 percent in July 2017, pushing the U.S. share down from 89 percent to a still-dominant 81 percent. The American tourism industry’s standing among Canadian summer travelers doesn’t seem to have suffered much as a result of the Trump presidency; but the availability of a growing array of international destinations at reasonable prices is certainly taking a bite out of their market share. This shows signs of being particularly felt in the northern border states whose tourism industries long courted road-tripping Canadians — a form of travel losing some of its lustre as more exotic options beckon. We haven’t seen a rush of potential new entrants into the Canadian airline market like this in 15 years. Winnipeg-based NewLeaf Travel started operations just over a year ago as a “virtual airline”, selling low-priced tickets to places like Edmonton and Hamilton on chartered Boeing 737s. In recent months, Flair Air, NewLeaf’s primary chartered-aircraft provider, purchased NewLeaf’s assets and started operating the service under the Flair brand. More recently, WestJet announced plans to start an ultra-low-cost “airline within an airline” to compete on price-sensitive routes. Jetlines, a completely new startup, announced a Summer 2018 proposed launch date; and Enerjet, a small Calgary-based charter operator, also hopes to get a proposed ultra-low-cost airline called FlyToo into the air. All hope to avoid the fate of the low-cost startups of the late ‘90s and early ‘00s. These included Greyhound Air (Greyhound quit the industry in 1997, aircraft operator Kelowna Flightcraft survived), JetsGo (bankrupt, 2005), CanJet (changed from a scheduled operator to charter operator, 2006; suspended operations, 2015) and Harmony Airways (suspended operations, 2007). Quite often, high taxes and fees have been blamed. For example, a Sept. 6-13 round-trip between Winnipeg and Montreal on Air Canada can be booked for $391.57 if you’re willing to fly on the less heavily booked flights. Of this, $89.57 — or 23 percent — is made up of taxes, fees and charges. The other challenge is in convincing enough passengers to part with enough money to make the venture profitable. Let’s take Ryanair, one of the industry’s fiercest penny-pinchers, as an example. This is the airline alleged to have pressured flight attendants to meet sales targets, spread families and couples randomly throughout the cabin for not paying extra for seat selection, and which mused about charging passengers to use the toilet. Ryanair’s costs are impressively low, averaging out to just 3.63 U.S. cents (4.6 cents Cdn.) per seat per kilometre in recent times. Only a few airlines, such as Air Asia, have been able to wrestle their costs any lower. One way Ryanair does this is by packing more seats into each aircraft: one of their Boeing 737-800s can carry 189 passengers; WestJet only fits 168 seats into the same space. What if a Canadian operator, hypothetically called JetManitoba, started flying Boeing 737-800s around North America, and matched Ryanair’s low costs through a combination of low wages, no overnight crew stops, high-density seating and a stringent nobody-gets-anything-for-free pricing model? JetManitoba Flight 1, our hometown low-fare leader, starts out early in the morning with a round-trip to Vancouver and back. In the afternoon, it does another round-trip to somewhere else. At a rock-bottom cost of 4.6 cents per seat-kilometre, JetManitoba’s 189-seat Boeing 737 needs sales of $32,516 (before taxes, fees and charges) to make each Winnipeg-Vancouver round-trip nominally break even. No problem, you might think. $32,516 divided by 189 seats is a very reasonable $172 per seat round-trip. Add the taxes, fees and charges to that, and you can still offer a no-frills round-trip to Vancouver for less than $300. Just make the profit off of charging people $25 per checked bag or roll-aboard, $15 per person each way for seat selection (at risk of being assigned a random seat if you don’t pay up), and $15 per person for a drink and a sandwich (because JetManitoba has a monopoly on food sales at 36,000 feet). Now, imagine it’s early February. The Canadian tourism industry is largely in hibernation. Winnipeg is under a Wind Chill Warning because it’s -24°C at midday, with the wind blowing from the northwest at 30 gusting to 50 kilometres per hour. In Vancouver, it’s raining as usual and no one has actually seen the sun in more than a week. Hardly anyone wants to be on holiday in either city. Then what? The business travellers, who have no choice but to travel, tend to prefer Air Canada and WestJet over JetManitoba because of the better schedules. That leaves you largely with a tiny pool of would-be passengers that you somehow need to get at least $32,516 from to make each Winnipeg-Vancouver round-trip break even. It doesn’t matter if you convince 189 people to part with $172 (plus taxes, etc.) each or 50 people to part with $650 each. It’s raising enough to cover that average of $32,516 in bills per round-trip that counts. You could have a sale, offering 25 seats you know you will never sell for $172 for $99 or even $59 just to get a bit of cash flow to help you get through the low season, even if the flights are unprofitable. Or cancel your Winnipeg-Vancouver service until the summer and fly to places that people actually want to fly to in February, such as southern resorts, competing directly with other airlines already serving these destinations. Again, for each round trip, you need to find a way of separating enough people in the community from enough money to keep your bills from falling into arrears. Not easy if there are more seats available than people capable of filling them. Or just park the plane and lay people off until the tourism business starts to pick up again in the summer. You’ll still need to pay for the plane, if you can’t rent it out for the season, but at least your payroll and fuel costs will come way down. Those are the challenges of running an ultra-low-cost airline in Canada. It is very difficult to make it work in a country where domestic leisure tourism all but shuts down for two-thirds of the year, the less price-sensitive business travel market is already well-served, and the seasonal international leisure routes are also well served by existing operators. The ultra-low-cost-carrier business might start out with four contestants. Don’t bet on it carrying on like that. * – Seat-only prices. Baggage, seat selection, food, beverages, etc. all extra. The world is becoming smaller, travel is becoming easier and globalization is making cities more homogenous. As a result, tourists have begun to look more often for unique stories and authentic, local experiences in non-traditional destinations. In recognition of this changing trend, last Friday a new initiative was launched to further attract this evolving tourist market as well as provide Winnipeggers with a new experience in their own city. Design Quarter Winnipeg is an organically organized, grassroots initiative hoping to position downtown Winnipeg’s artistic community as a design and cultural tourism destination. The idea hopes to bring together local, independent, design-focused events, shops, services and organizations under a single marketing umbrella, empowering them by establishing a broader collaborative network. It’s modelled after existing programs in similarly isolated winter cities Reykjavik, Iceland and Helsinki, Finland, where the design district concept has strengthened their civic image as design centres and tapped into new opportunities in the growing trend of cultural tourism. Indeed, long-haul international travel has never been as affordable to both Canadians and to many foreigners as it is today, or as easy to plan online, offering opportunities for places considered “flyover country” to develop small but lucrative niches. Tourism is like a library. Just as probably 99 percent of the books in the library are of absolutely no interest to 99 percent of the population, so too are 99 percent of places in the world likely of absolutely no interest to 99 percent of the world’s population. But that one percent or even less who are attracted for some reason to that book on the shelf, or that place on the map — that’s what matters. One percent of Canada’s population, for example, is a still-substantial 350,000 people. Not that they’re all going to descend on Winnipeg all at once, or even visit at all. But if the narrative is right, they might consider the possibility. Which brings me back to the “similarly isolated winter cities Reykjavik, Iceland and Helsinki, Finland” noted above. In recent days, I actually seriously looked at the possibility of taking a trip to Helsinki this summer. Helsinki ticked a lot of the right boxes: the airfare-plus-accommodations price of a visit was competitive; the summer weather isn’t too bad; the seaside setting was appealing; the fact that many Finns speak English would have made communication easy; Finland is a safe country with a strong culture of trust; and Helsinki is considered by some visitors to be an underrated city that could become the next “hot” city to visit for a weekend city-break. There was also something appealing about visiting a more normal and serene European city like Helsinki, not being in the mood just now for the Disneyland-for-Adults environment that can characterize A-List cities like Paris, Amsterdam and Rome. And I just plain like the Nordic countries, having been to Denmark and Sweden on two previous holidays. They’re not the cheapest places, but the Nordic countries are “Order People” (as opposed to “Chaos People”) cultures who like to keep things running smoothly, and you can afford to relax a bit more. If it had been easier to pair Helsinki with somewhere or something else — nearby Tallinn, Estonia is apparently a great city, but suffering from weak air links for visitors from North America — the narrative might have been complete. So too it might have been if the city offered a wider array of thematic walking tours, which is an area where Helsinki has a weak selection on a walk-up-pay-and-go basis. Cities that don’t have a good offering here are less competitive for the burgeoning solo-tourist market. These are people for whom spending an afternoon walking around town, conversing with fellow Canadians, Australians, Americans, Brits and other nationalities who share their interests, is far more fun than visiting yet another (*yawn*) famous museum. Winnipeg faces those same challenges as Helsinki in attracting tourists. Tourists will come here if there is a good supporting narrative. Some people come from further afield because there are similarly strong narratives supporting their visit. These include, “We can’t do the kind of fishing and hunting we can do in Northern Manitoba back home in Germany,” or “I’ve been cooped up on this train from Toronto for 36 hours; let me off before I lose my goddamn mind!” That last one might be a bit crude, but it’s a fantastic rationale for spending a few hours being a tourist in Winnipeg. The supporting narrative matters. Give people a convincing answer as to “Why should I spend a [day, weekend, week] in Winnipeg and not in [insert place name here]?” and their odds of actually paying a visit soar. It’s possible that 99 percent or more of the world’s population will never have a good answer to that, no matter what. But, so what? Like that seemingly untouched book in the library, to someone somewhere, for the most complicated of personal reasons, that’s exactly what they’re looking for. The key is to find that person. Difficult as it might be to imagine today, at one time Canadians did not even require passports to visit the United States. Then came the terrible events of Sept. 11, 2001, and it was soon clear that those days of going through little more than a casual inspection to cross the international border were coming to an end. In 2004, the National Commission on Terrorist Attacks Upon the United States — better known as the 9/11 Commission — released its report on the Sept. 11 attacks, and recommended that Canadians, Mexicans and Bermudans be required to show passports or other secure documents proving their identity to enter the United States. The same rule would apply to Americans returning from those countries. Prior to this, many Canadians had never owned a passport. It wasn’t necessary to have one if you were travelling to the United States — which offered a range of destinations from big cities to mountains to coastal resorts — so few bothered to apply for one. In any case, obtaining a Canadian passport came with its own archaic rules which seemed to assume that most Canadians still lived in small towns, as we had a century earlier. For example, you were required to have a guarantor from among a limited list of professions deemed trustworthy by the federal government. If you didn’t personally know a professional engineer, local mayor, ordained minister or postmaster for at least two years, you could always ask your dentist or doctor for the favour. But the Canadian government quickly realized a big change was coming, and began to simplify the process of applying for a passport. The official announcement came on Nov. 22, 2006, in a U.S. State Department news release: “The requirement for citizens of the United States, Canada, Mexico, and Bermuda to present a passport to enter the United States when arriving by air from any part of the Western Hemisphere will begin on January 23, 2007.” It was expected that the passport requirement for land or sea crossings would take effect by Jan. 1, 2008. In just a few years, Canadian passport ownership rates rose significantly. In 1999-2000, the Canadian government had issued a little over 1.5 million passports to a population of 30 million. In 2005-06, it issued more than 3.1 million passports. Ten years after the U.S. passport requirement went into effect, Statistics Canada data shows that those new passports gave Canadians a case of wanderlust that still hasn’t subsided. The red squares on the graph below show the number of Canadians returning from countries other than the United States annually between 1972 and 2015. 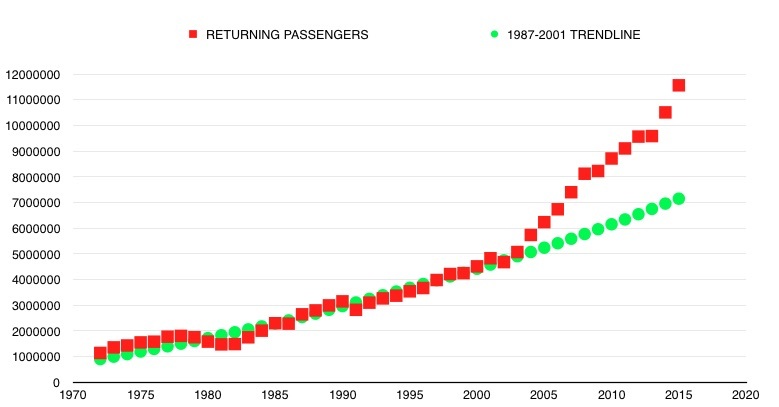 The green circles represent the growth trend line based on the period from 1987 (when airline deregulation allowed lower international fares to be offered) to 2001 (when the 9/11 attacks shattered the status quo). The green circles suggest that the 1987 deregulation did not give Canadians a newfound urge to go out and explore the outside world. Even if you had no idea how many Canadians came home from abroad each year in the ’70s and ’80s, merely extending the 1987-2001 trend line back to 1972 would have given you a decent estimate. After 1987, the number of Canadians coming home from abroad each year continued growing until 2003 on a trajectory not much different from the 1972-1987 trajectory. In 2004, something changed. That year, the number of Canadians coming home from countries other than the U.S. was 13 percent higher than the year before — the first time since 1987 that year-over-year growth had exceeded 10 percent. In fact, during the preceding 10 years, five percent year-over-year growth had been more typical. Thereafter, growth charged ahead at eight to nine percent per year until 2008, and then slowed to more anemic levels usually under five percent between 2009 and 2013. In 2014 and 2015, growth surged again at about 10 percent in both years. By this time, the 1987-2001 trend line had clearly been departed from, and a new trend line had taken its place. Had nothing changed, the number of Canadians coming home from abroad should have risen from a little over five million in 2004 to about seven million in 2015. Instead, it took only three years to hit seven million, and another year to hit eight million — a figure it otherwise should not have reached until about 2018 had nothing changed. In reality, in 2015 alone, more than 11.5 million Canadians had come home from countries other than the U.S. Year-over-year growth in the first 10 months of 2016 was relatively weak — about three to four percent overall — so the final number for 2016 should be around 12 million once that information is available. The 2007 U.S. passport requirement was a rule change that many Canadians weren’t fond of at first. But its introduction unleashed a desire among Canadians to go out and see the world beyond North America, hopefully coming home not just rested and relaxed, but with a bit of fresh thinking as well. That’s cause enough to wish America’s passport requirement a happy 10th birthday indeed. Now if only we could do something about that stingy two weeks’ annual holiday thing we’ve got in our labour laws. If you want to find quick sympathy in Canada in January, you can complain about one of two things: the weather, or the airlines. “Long-time air traveller Guilford Boyce says he misses the golden age of travel, when airlines went out of their way to make passengers feel special,” a Jan. 2 CTV News report noted, in a web article titled “Passengers lament ‘nickel-and-dime’ fees as airlines face thin profit margins”. Indeed, the days when airlines promoted themselves on the basis of their service — at least in Economy Class — are gone. To the extent that they still do compete on service, it’s usually in their expensive premium cabins. But if we, the traveling public, are getting less pampered in our close-together Economy seats, at least we can claim that we are getting better mileage out of our dollars. A web site called Departed Flights has posted a collection of image scans from old airline timetables. One of the more interesting scans is the Winnipeg page from a Northwest Orient timetable published in December, 1974. The Twin Cities-based airline, which dropped the “Orient” part of its name in the ‘80s and was absorbed into Delta Air Lines some seven years ago, published its each-way fares in its timetables. This was possible at the time given that air fares were government-regulated, and set at fixed prices proportional to distance, even if these prices were at odds with supply and demand. And those fares were usually eye-wateringly expensive by today’s standards. Keen to get away from Winnipeg’s winter cold to someplace warmer, like California? A 1974 round-trip to Los Angeles or San Francisco would have set you back $290 Cdn. — or $1,366 in 2016 dollars. A round-trip to Tampa/St. Petersburg, Fla., meanwhile, would have cost the equivalent of $1,281 in 2016 dollars. Currently, July 2017 round-trips between Winnipeg and both Florida and California are priced in the $700 to $800 range. The only fare that is more expensive today than it was in 1974, after adjustment for inflation: the relatively short trips to Minneapolis/St. Paul and to Chicago; and presumably to Grand Forks. It’s also instructive to observe how much further one can go for the same amount of money in 2017 compared to 1974. The same amount that one would have needed to fly to New York City and back in 1974 — $222, equivalent to $1,046 in 2016 — would pay for a round-trip to Shanghai thanks to the current trans-Pacific fare wars. As for that 1974 $296 round-trip fare to Miami — equivalent to $1,366 in 2016 dollars: Today, the same amount would pay for a round-trip journey to Madrid. And the $250 you would have spent in 1974 to go to Boston — $1,178 in 2016 dollars? That would get you to London and back today. So, while passengers might be packed in closer together than ever, less fed and less pampered, today is still arguably the golden age of international travel. Never have so many been able to travel so many miles at such a low cost. Who’s more likely to visit Canada in the summertime? It’s early August, and that means that Canada’s tourism industry is in full swing, with not just many Canadians being on holiday, but many foreign visitors arriving as well. The single largest source of foreign visitors might not surprise you: in July and August 2015, 3,954,528 American visitors entered Canada by car, aircraft, train or ship according to Statistics Canada, more than 10 times the number of British (218,438), French (159,063), Chinese (158,496) or Australian high-season visitors (79,206). But it might be surprising to learn that, on a per capita basis, the United States ranks fifth in terms of its citizens’ propensity to visit Canada during the summer high season, with 12.4 visitors to Canada per 1,000 U.S. residents. Residents of the French territory of St. Pierre and Miquelon, just off the coast of Newfoundland, made 672.9 visits to Canada per 1,000 residents, a not-so-surprising figure given the territory’s isolation. The other three among the top five were current or former British colonies linked to Canada by proximity and migration: Bermuda (73.1 visits per 1,000 residents), the Cayman Islands (32.7) and the Barbados (13.2). Of the long-haul markets, Hong Kong residents and the Swiss (5.6 and 5.3, respectively) showed the strongest interest in visiting Canada in the summer of 2015. Hong Kong residents were most likely motivated by personal ties to Canada, given that the severely undervalued Hong Kong dollar would make Canada seem unusually expensive (while making Hong Kong better value for Canadians heading over there). For the Swiss, however, the drastically overvalued Swiss Franc makes the rest of the world a bargain, Canada included. If distance, exchange rates and migration patterns all shape foreigners’ willingness to visit Canada, so too it seems does language. Making more than three visits per 1,000 residents, the New Zealanders, British, Australians and Irish show a greater propensity to visit Canada than do residents of, say, most European countries — even the economically healthy Nordic ones — with the exception of the Icelanders, the well-off Luxembourgeois and the aforementioned Swiss. theviewfromseven on Trump Slump? Not really.